Great desks for your coastal décor! Pacific Home Furniture knows how hard it is to work in a coastal home. But if you’re fortunate enough to live in one full time or just need a place to write the next great American novel while on vacation, you need a great desk to be productive and knock that work out. Our collection includes a variety of desk styles, sizes and finishes to suit any décor style. If you need a great corner desk to fit in the family room or a smaller computer desk you can add to the playroom you’ll find great choices here. 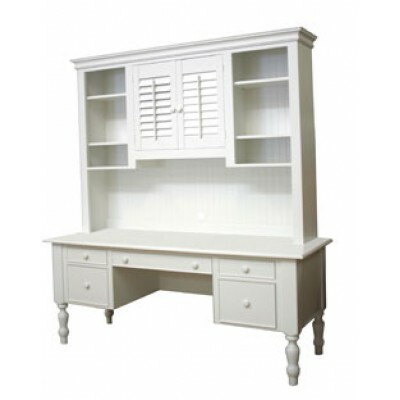 We have small writing desks perfect for a small study or choose a piece that does double duty like a secretary or a dressing table. Computer cabinets are great because when you need to work you can open it up for full access but when you’re done and want to forget about it, just close those doors. Out of site and out of mind! Desk with Turned Legs - Coastal Cottage CollectionPacific Home Furniture’s Computer Desk w..
DeskPacific Home Furniture’s Farm Style Desk is the perfect addition to your den or office.. Corner DeskThis Island Corner Desk from Pacific Home Furniture works great in any room of your h..
White DeskThis Middleton Creek Desk from Pacific Home Furniture works great in any room of your ..
Computer CabinetPacific Home Furniture’s Palmetto Computer Cabinet is the perfect addition..
Pedestal DeskThis Pedestal Desk from Pacific Home Furniture works great in any room of your home..
Computer DeskPacific Home Furniture’s Plantation Computer Desk is the perfect addition to ..
Secretary DeskPacific Home Furniture’s Salt Marsh Secretary is the perfect addition to you..
Small DeskPacific Home Furniture’s Small Desk or Dressing Table is the perfect addition to.. Writing DeskThis Texas Writing Desk from Pacific Home Furniture works great in any room of your ..